Smile Foundation has joined hands with Burrp!, a pioneer in the food discovery space, to celebrate the Joy of Giving by announcing the DINE WITH SMILE campaign .The launch event was hosted by Barbeque Nation, Lokhandwala. Smile Foundation, in partnership with Burrp, has initiated a unique concept ‘Dine with Smile’ to encourage responsible dining. Dine with Smile brings together restaurants and diners from across the country in an endeavour to raise support for nutrition of underprivileged children. The initiative is part of Smile Foundation’s ongoing Nutrition for Education campaign. You too can be a part of this. The campaign will be running on Smile with Burrp where restaurants can join the campaign and support nutrition for minimum 1 kid for a year. This campaign is from 3rd October to 14th November, 2016. 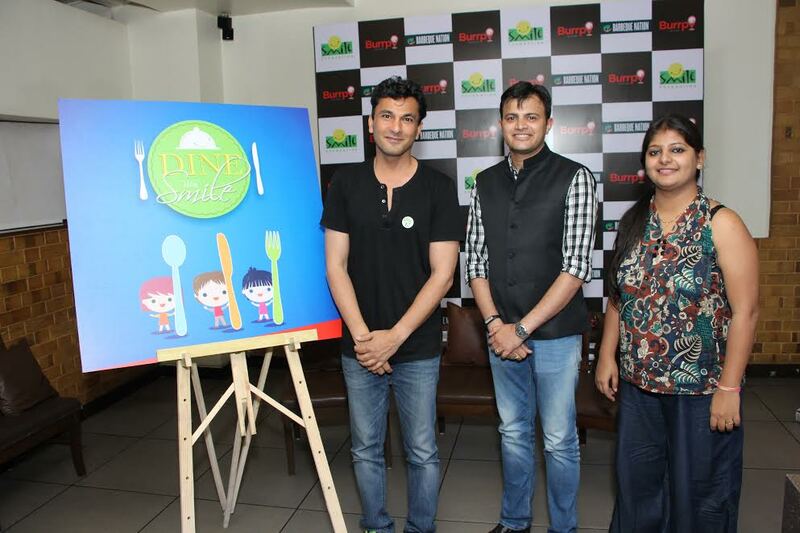 5 Times Michelin starred Chef Vikas Khanna has been a vital part of Smile Foundation’s Nutrition for Education campaign since the very beginning and has been spearheading awareness campaigns and fundraising events in favour of the cause as its Goodwill Ambassador. Speaking on this occasion Chef Vikas Khanna said “One in every three malnourished children in the world is from India. The consequences are long-term and it prevents children’s overall growth, learning ability, going to school and a chance to come out of the vicious cycle of poverty for yet another generation. Thereby it also prevents the country’s growth. The objective of this initiative is to raise awareness on malnutrition and its overall impact on children and to encourage more people to join this cause and support to bring the much needed change. Through the medium of this initiative, we will not only be able to provide nutrition to underprivileged children but also help them to get better health therefore better education and a brighter future." Mr. Pradeep Prabhu, Co- Business Head, Burrp! said, "We are glad to be associated with Smile Foundation for Dine with Smile campaign. It is a pleasure for us to be able to contribute to the society for a better tomorrow. We at Burrp strongly believe that the country can only succeed if our children today are healthy. " Mr.Mitu Mohanan, Regional Manager (RM)-West, Barbeque Nation Hospitality Ltd. said "We are proud to kick off the Dine with Smile Campaign from Barbeque Nation. Education and nutrition of children are the bedrocks of founding a prosperous nation. We are pleased to host the launch event for this commendable campaign." In India, food has always been considered sacred, a token of love, shared happiness and care. Which makes it even more unfortunate that more than 25 million children in our country have to sleep hungry every day. For them food means the struggle to survive. Childhood is said to be the best part of one’s life – but for these kids, surrounded by poverty, hunger and hopelessness; many of them not even getting a single full meal in a day – a happy childhood is a distant dream.